For a 14 year old, Sugar has healthy teeth. Definitely, our weekly dental routine has paid off. Incorporating dental chews like Whimzees has greatly helped clean Sugar’s back teeth that are hard to reach. Whimzees are made from vegetable-based ingredients that equate to a gluten free and 100% vegetarian dog dental chews. It is made in Holland with natural ingredients such as Potato Starch, Glycerin, Powdered Cellulose, Lecithin, Malt Extract, and Yeast. 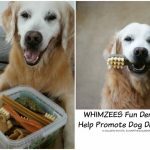 What Makes Whimzees Dental Chews Unique? Whimzees’s colors and shapes make it unique and fun to chew. 1) Alfalfa Extract is used to make the green color and contains Vitamins K, C and beta-carotene. 2) Annatto Extract creates the orange color from the Annatto fruit and rich in antioxidants. 3) Malt Extract is used to make the brown color and helps enhance natural flavor. 4) Calcium Carbonate creates the all natural white color on the XL Toothbrush Whimzees (Sugar’s favorite) and helps reduce the risk of tooth decay, and maintains strong healthy bones. Sugar’s favorite Whimzees shapes are the Stix, Hedgehog, Alligator, Toothbrush and Toothbrush XL. 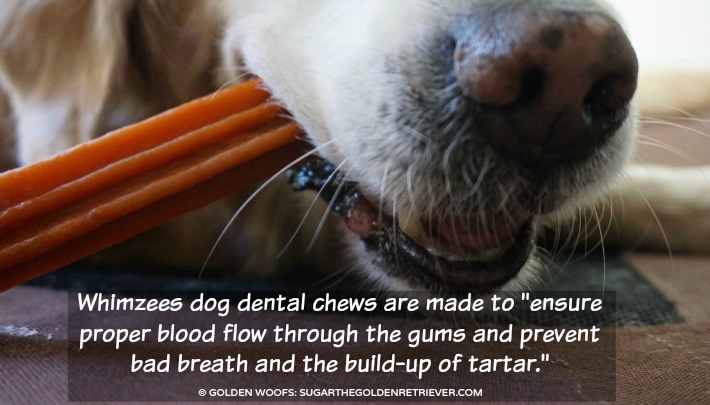 1) The Grooves from the dental chews helps reach smaller spaces between your dog’s teeth. 2) Easier for your dog to grip and chew from the Hollow shapes & spaces. 3) The Unique Knobby Shapes scrapes away build-up plaque and tartar that helps prevent dog bad breath. Whimzees Keep Sugar’s Golden SMILE Healthy! Lots of Golden Thanks Whimzees! Sugar is nuts about your dental chews! Oh! She loves the Alligators chews you sent. Whimzees satisfies her chewing needs and provides great benefit cleaning her aging teeth. If you plan to give Whimzees to your dog, I recommend you get the appropriate size, and always supervise your dog chewing. 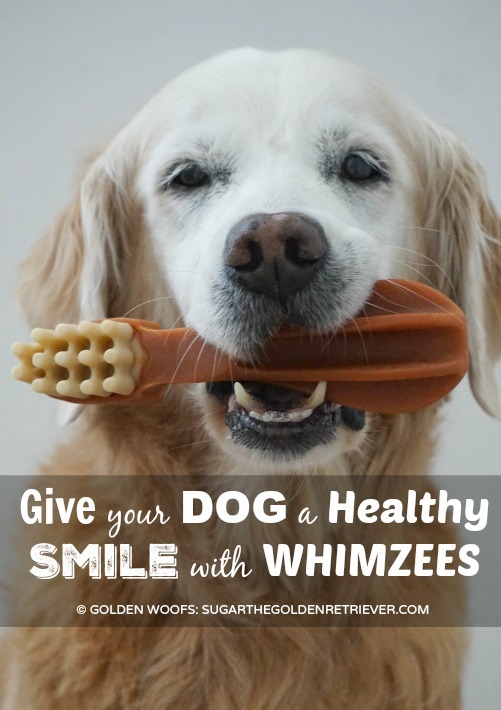 The folks from Whimzees are providing one of our readers a bag of dental chews. Follow the giveaway tool for a chance to win. How do you keep your dog’s teeth clean and healthy? I sees potato and alfalfa… so not fur me… I’s allergick to both of those! Our guys get dental treats to keep them clean. We use dental treats to keep their teeth clean! I give our dogs raw bones to chew on and get the bone marrow out. I have purchased Whimzees. We use dental treats occasionally but we have tried brushing Bowser’s teeth… it went okay. He certainly didn’t like it so we are always looking for alternatives! I buy dental treats and now they have raw bones. We brush our dogs’ teeth and we give them dental chews. We use dental treats and some times tooth brushing. These look right up Miss Nyah’s alley! i brush my 3 gals teeth every nite or try to, they go to dental specialist for check up abt 2/yr. the baby gets her teeth cleaned 2/yr b/c of her dental problems, she has had root planing and gum graphs. the girls have had fillings as well. they get dental powder in their food, dental rinse in their water, i use the proxi brush to get b/t the teeth and floss as well. i also have a dental scraper and other tools at home that i use. We use dental treats and chews but always try to read the ingredients. I use a toothbrush and toothpaste for dogs. I also give them dental chews to help. Plenty of Nylabones keep their teeth very clean. Plus, regular check ups and cleanings if needed. Ruby gets greenies and a yearly dental cleaning and exam by our vets at Banfield. Occasionally we brush her teeth with dog toothpaste. oil,but they do not like it. I have a small dog. I gave up on the huge doggie toothbrushes and bought soft baby (toddler) toothbrushes and use doggie toothpaste. She loves the taste. Nala gets dental treats and the occasional raw bone to keep her teeth clean. We give him dental chew treats to keep his teeth clean. Thanks for the giveaway! I brush Coco’s teeth every week and I also give her dental chews. She has great teeth. Her vet tells me all the time how great her teeth are. I brush my dog’s teeth with a dog toothbrush and toothpaste. I also feed her Dental Chews and let her use a Pooch Smooch, which is similar to an OraPup. From time to time I also use mouth wipes. We have tried brushing our dogs teeth but usually use treats. I buy dental chews and bones. I get dental chews and treats for Bailey to help his teeth. We had fun reviewing these too! We use whimzees or other dental treats. I buy him dental chews. 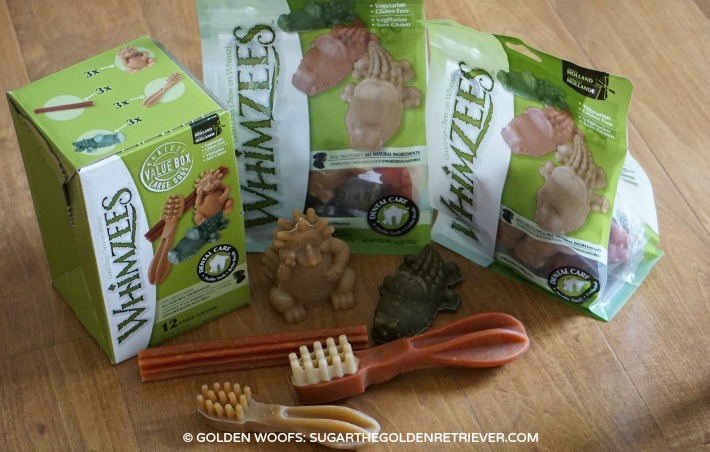 We give our Malamute dog chews and treats, but have never tried Whimzees! I tried putting stuff in my dog’s water, and brushing his teeth, and treats. He like the treats the best. Dental treats are awesome for keeping my pups teeth clean! i don’t do anything for the dogs teeth, i hope they are alright. I currently brush my dog’s teeth to keep them healthy but he needs more. Greyhound are notorious for bad teeth. Admittedly it is not a favorite activity, but I brush her teeth. Sometimes more teeth get brushed than at other times. She like anything with peanut butter or cheese flavor. I brush their teeth with little fingertip brushes. It’s always a laugh! I brush my babies teeth 2 times daily with a little help from hubby. Take him to the vet regularly for a cleaning. We have always bought those dental chews, but our dogs have started not liking them as much. I’d love to try WHIMZEES! My dogs really need these. They don’t have good breath and they won’t let me brush the b a co teeth. We give them dental chews everyday and brush their teeth once a month.